As for the rest of the book: don’t be intimidated if you had to read The Scarlet Letter in school as part of the curriculum and didn’t like it. Reed took two dynamic characters and made them entirely her own. The result is a novel built around the relationship between a mother and her daughter, their struggles to survive on their own, and the ways they discover themselves through their treatment of each other. Don’t even be intimidated with the history--Reed keeps a running commentary made necessary by Hester’s involvement in the government, drawing on a rich history and tumultuous times to give her quite an adventure. There were a couple of things I particularly enjoyed, one of which was Hester’s relationship with John Manning, the only character lively enough to stand out in an almost entirely Puritan cast. The scene where Hester is first invited to White Hall and stands admiring the painted ceilings was the first of their philosophical discussions together. Laced with innuendo and flirtatious intelligent discourse, it was only a matter of time before Reed paired the two off again. In a way unique to Reed, the two discuss matters of religion and reality, inspired by an apple at lunchtime. There are some beautiful and insightful lines throughout the book, but most importantly, in conversation between John and Hester. The undertones of their meetings motived the feel of the novel; caution and danger fly in the face of passionate freedom and hidden desires. Because I am reviewing an ARC, I’m obliged not to quote directly from passages or pages that might have changed for publication, but for the most part, Reed’s writing was accessible and assumed an intelligent reader. There were a few awkward spots of prose, mostly when she referred to Hawthorne’s scenes to give her characters memory of past events as he imagined them, or when I found a few modern phrases that I felt stood out of place with the feel of the rest of the dialogue. The only other odd thing I found was the foundation of Hester’s adventures: her adultery gifted her the ability to see sin in others--a fantastical talent that at times, felt unbelievable, especially because in the mid 17th century, I’m supposed to believe the most powerful man in England turns to a commoner for help exposing traitors and Royalists (those that would have a restoration). As long as you believe in her ability to look someone in the eye and see if they’ve sinned, then you’re free to enjoy the rest of the book. If you don’t, you’ll have a harder time of it, especially because all that Hester becomes is contingent on not only readers believing it, but Cromwell and his retinue (who eventually learn to fear her). To top that off, when she confronts Cromwell about exploiting her she winds up becoming his conscience instead of “quitting” her current position. The prose was enjoyable, the characters grew on me, but what had become a novel about Hester doing everything in her power to give Pearl the opportunities she never had, ended ultimately in disappointment. I didn’t like the ending. Maybe I lack the insight to appreciate it (I try really hard in the insight department), but I thought it was an unexpected way to turn Hester’s penance--something I thought Reed had made quite clear was something she felt she’d finished already--into yet another chapter of her life. To have Hester become as powerful as she did emotionally, as well as politically, only to have her fuse back into her shell and pine away her years in torment over what she’d done to Arthur was, I thought, completely out of character. I didn’t mind so much how she left things with Pearl, that was believable, but to punish herself after being exposed to public shame (during which, supposedly, she’d accepted what she’d done) and punishment for decades afterwards is a slap in the face to every inch of growth she’d gained in forgiving herself. Honestly, I thought it was a bit ridiculous, but as a reminder: Hester had to go back to America alone; I don’t remember her frame of mind at the end of The Scarlet Letter to judge whether this guilt was Hawthorne’s or how much was imagined for Hester from Reed. Either way, I didn’t like the end. The rest of the novel, however, I enjoyed, but realize it’s not for everyone. I only have to warn readers of one last thing: if reading radical discussions against Puritan ideals isn’t something you think you’d like or something you don’t think you could put into context to enjoy and understand the novel, Hester is not for you. Mostly it reads smoothly, with little attention paid to romance in favor of political survival, friendship, and the relationships between men and women; women and their daughters. 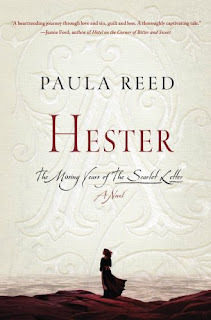 Hester will be released in the US on February 16th in hard cover. However, I won't be picking up HESTER: THE MISSING YEARS OF THE SCARLET LETTER. I have to admit that I'm prejudiced against novels and novelists who must bank on someone else's story/idea. Then again, I may just know too many people who eat up the Jane Austen knock offs. So tell me, wise Jawa, what do you think? Is such a book prejudice something I should endeavor to remove, or does it truly show a lack of creativity to have to begin with a story someone else wrote? You make a good point. I was talking to Pete about it and realized, as I was explaining the process of writing the review, that the more I wrote, the less I liked the book. I don't mean that as an insult to Reed because I do think she's talented, but because the book is so dependent on The Scarlet Letter--you have to either have already read it, or know about it (and the premise) to approach the book. As a stand alone, it's ok, but not as strong as it is when taken as a direct response to Hawthorne's book. I think that's due to the nature of her story--she chose a narrow window to fill which constrained her characters in the long run; Hester had to return to America because Hawthorne, not Reed, said so. Sometimes that bothers me. I don't think it shows lack of creativity. On the contrary, she did a lot with Hester, Pearl, and many other characters. Writing in someone else's universe is, in a lot of ways, harder than creating something out of nothing (I read a lot of Star Wars books ;) ). It also shows how much of a fan Reed is. The best form of flattery is imitation, after all! What's so great about this book is Reed doesn't try to "write like Hawthorne." The biography in the book for her mentions she's a high school English teacher and so, has taught The Scarlet Letter for years. I think she used her insight to tell what she thought might have happened during those missing years and how based on her understanding of the characters and themes she's been teaching. She comes from a good position, I think, to write the novel. There's always this to keep in mind: new authors may take someone else's work as a jumping off point, but they do always make it their own. That can be either good or bad, depending on how attached you become to the original characters or writing (which, to be fair, are all part of what makes a book so interesting). It's entirely up to you if you want to keep your prejudice and I don't think anyone would judge you against changing it, but it does open up a new perspective to venture forth into those novels that are written well and from long admiration. Your caution is understandable, though, because some authors, like Austen, have an inordinate amount of admirers wanting to play in her world. In that case, discretion is always the best option. There are some books which are probably bound to be better (entertaining, interesting) than others as long as they choose to write with a certain premise in mind. Those are the most successful ones. Like "Bridget Jones' Diary"--which I love! (okay, I've only seen the movie, but about a million times). Reed chose such an interesting jumping off point that I thought, why not try it? She wasn't continuing his work, she was trying to fill a gap he left open with what she thought might have happened. It was an enjoyable journey, for the most part, if constrained and confusing in the end. I just realized I've been going on forever and I don't even know if I've answered your question! I've never heard of this book but I liked the Scarlet Letter, although I'm not a big fan of Puritan beliefs (much too prim and dull for my tastes! And hooribly judgemental during the 1600s). I think the idea is an interesting one, what did happen to Hester and Pearl? I'm disappointed that Hester seems to take one step forward and two steps back by the end of the book, I would rather her stay strong and independent! Interesting discussion in the comments. I don't always mind authors who sue others ideas, until it becomes ridicuously overused (a la all the Jane Austen knock offs and Twilight). But if it's only done a couple of times, that's ok by me! Like I often hear A Wish After Midnight compared to Kindred by Octavia Butler. I haven't read Kindred but not many books besides AWAM have been compared to Kindred and that's good. But I agree, imitation is the highest form of flattery. Perhaps so, but I still can't get it out of my mind that if you have to base out of someone else's creativity, there's something lacking. Unless you run absolutely wild with it. I suppose I see too many 60 Years Later and Austen knock offs and too few truly original spin offs. And yet, I place the new Bond novels, Star Wars, Resident Evil in a different category. To an extent it becomes a homage to the world rather than about the author, I think, and takes away that need for creativity and originality. @TJ: Movie spin-offs are different, I guess? They change medium (aside from Bond who went book-to-movie-to-book) and so we are more forgiving of any faults present? This kind of touches on why I like fairy tale re-tellings where the author completely claims the tale as their own and doesn't just rewrite it in their own hand. I feel the same way about books like Hester (which is probably why the ending frustrated me so much--Reed couldn't completely make it her own, not Hester's physical movement, only her emotional state). I think you're right that movie spin-offs/etc change the medium. (Bond is a strange case, but I'm primarily talking about the post-Fleming books). I think fairytale spin offs are almost always very careful to render the story completely differently. That I'm cool with. After all, these stories are so oft-told and old that they're a part of a mythos now anyway. Yet, I can't bring myself to see a new book that entirely operates (or mostly operates within the constructions of someone else's story (especially without that author's consent) as something positive. Of course, there are exceptions, such as Wide Sargasso Sea, which only hints at what world it began in. I agree...I have an extremely difficult time reading something that was originally crafted by someone else. @TJ: I don't actually think I've read a book like Hester before, but the basic premise of writing in someone else's universe (movie tie-ins not included) isn't something I usually gravitate toward.